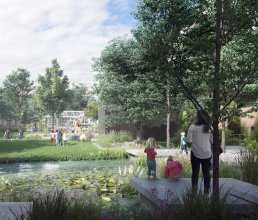 Copenhagen Municipality and its citizens will co-construct luxuriant courtyard gardens that have the added benefit of managing the city’s rainwater. The Courtyard Gardens of the Future (Fremtidens Gårdhave) is a city development project designed to explore how Copenhagen’s courtyards can contribute to local rainwater management. The goal is to develop innovative and recreational rainwater management solutions with a bottom-up approach that caters to residents’ needs, and with a design that integrates the courtyards into their neighborhood. The project has involved two stakeholder groups – committed residents and professionals – in the co-creation and development of new solutions for the community’s future courtyards, ensuring that the project is both inclusive and innovative. The courtyard gardens demonstrate that rainwater can be retained and detained in rain beds, lakes and canals which form part of the beautiful gardens where residents can relax and hang out with others. For example, low lying areas in the courtyard on Askøgade can slow and hold rainwater during a cloudburst. Meanwhile, in the courtyard on Straussvej, the lawn area is bordered with recycled concrete, forming a “pool” that can retain rainwater. The Courtyard Gardens of the Future focus on creating a model for sustainable community green spaces with greenhouses and urban gardens. Courtyard Gardens of the Future creates secure, inclusive and accessible green spaces. Each courtyard is designed with a bottom-up approach based on the needs of the residents. The courtyard on Straussvej has been designed based on the responsible use of resources. 90% of the construction materials are recycled, and rainwater is treated to a high quality for use in the area. Together, the projects are examples of how collaborations and partnerships between government authorities, citizens and experts can add value to communities and drive innovation.